Kane Allen Brown was raised in rural northwest Georgia and the Chattanooga, Tennessee area. He is multiracial; his mother Tabatha Brown is white and his father is black and part Cherokee. In 2018, he told People Magazine that he did not know he was biracial until he was 7 or 8 years old: "I thought I was full white... I found out that I was biracial and I still wasn’t thinking anything of it, but then I started getting called the N-word ... I learned what it meant, and that’s when it started affecting me. I got in fights over it when I was little." His father has been incarcerated since 1996 and he was raised by his single mother. His family, sometimes homeless, moved around when he was younger from Rossville to Fort Oglethorpe and LaFayette Georgia, finally settling in Red Bank, Tennessee. As a result, he attended many schools, among them Lakeview-Fort Oglethorpe High School in Fort Oglethorpe, Georgia where he sang in the choir with Lauren Alaina, the runner-up on season 10 of American Idol. He also attended Red Bank, Ridgeland, and Soddy Daisy High School. Kane grew up listening to country music, but became interested in R&B music in middle school. However, after winning a school talent show in 11th grade with a rendition of Chris Young's "Gettin' You Home", he began to perform country music. Brown auditioned on both American Idol and The X Factor after the success of his school friend Lauren Alaina on American Idol. He was chosen for The X Factor after an audition in 2013, but left the show when its producers wanted to include him in a boy band, after which he decided to post his cover versions of popular songs online. In 2014, Kane Brown began posting videos of his covers of songs by Brantley Gilbert, Billy Currington, Alan Jackson and other singers on social media. He started to acquire a following through these homemade videos on Facebook; an early video to gain wider attention was his cover of Lee Brice's "I Don't Dance". His cover of George Strait's "Check Yes or No", released on September 30, 2015, went viral and received over seven million views. The number of his followers on Facebook quickly reached over a million, and a clip of a teaser for his own single "Used to Love You Sober" released on October 8, 2015 received one million views in under three hours, and reached over 11 million views two weeks later. Brown was initially signed to Zone 4, and Jay Frank was his first manager. Later in 2016 Martha Earls became his manager. In 2014, Brown raised funds via crowdfunding site Kickstarter to produce a six-song EP, which he recorded in Nashville at the home studio of Noah Henson, guitarist for Brantley Gilbert. The EP, titled Closer, was released on June 2, 2015, and debuted on the Top Country Albums chart at number 22, selling 3,200 copies in its debut week. A single from the EP, "Don't Go City on Me", was first released on October 22, 2014, and it reached number 43 on the Country Digital Songs chart. Brown released a new single "Used to Love You Sober" on October 21, 2015, which is his birthday, and the song was spotlighted on Zane Lowe's Beats 1. It reached number two on the Country Digital Songs chart based on just two days of sales, with 38,000 copies sold. The release of the single also pushed his EP Closer up the chart to number 22 on the Top Album Sales chart. A second song, "Last Minute Late Night", was released on November 4, 2015, and debuted on the Country Digital Songs chart at number nine, selling 26,000 copies. Another, "I Love That I Hate You", followed three weeks later on November 30, 2015, selling 17,000 copies in the first week. Brown opened for Florida Georgia Line on their summer 2016 Dig Your Roots Tour. Kane collaborated with Chandler Stephens on a song they wrote together, "Can't Stop Love", which was released on February 12, 2016. Kane signed with Sony Music Nashville on January 27, 2016 and records under the RCA Nashville label. He released his first EP under the label, titled Chapter 1, on March 18, 2016. The EP includes the singles "Used to Love You Sober" and "Last Minute Late Night". It debuted at number nine on the US Billboard 200, and number three on the Top Country Albums chart, selling 30,000 units (23,000 in traditional albums) in its first week. On June 17, 2016, "Ain't No Stopping Us Now" was released for sales as a single from his debut full-length album. "Thunder in the Rain" was released as the second single from the album on August 3, 2016. He headlined his own Ain't No Stopping Us Now Tour produced by Monster Energy and Outbreak Presents starting on November 3, 2016. The self-titled debut album was released on December 2, 2016, and debuted at number 10 on the US Billboard 200. "What Ifs", which was recorded with his friend Lauren Alaina, was released as the third single from the album and has been certified Platinum by the RIAA. It became a Number One hit on the Billboard Country Airplay charts for the week dated October 28, 2017, the first for Brown and second for Alaina. It also spent five weeks at number one on the Billboard Hot Country Songs chart. An expanded deluxe edition of Brown's debut album was released October 6, 2017, featuring four new tracks, including a duet with Chris Young and "Heaven", which was released as the album's fourth single on November 13, 2017. On the release of the deluxe edition of the album, it went to number 5 on the Billboard 200, and returned to number one on the Top Country Albums chart. Together with his single "What Ifs", which also reached number one on multiple charts and the new song "Heaven" released with the deluxe edition, Brown became the first artist to have simultaneous number ones on all five main country charts—Top Country Albums, Hot Country Songs, Country Airplay, Country Digital Song Sales and Country Streaming Songs. On June 7, 2018, RCA Nashville released "Lose It" as the lead single to his second RCA album. A second track from the album, "Weekend", was released on August 8, 2018. On September 4, 2018, Brown announced the title, Experiment, via Twitter, alongside its cover art and news of the upcoming track "Homesick". Experiment was released on November 9, 2018. Kane Brown is married to Katelyn Jae. He announced their engagement during a concert in Philadelphia in April 2017. They were married at Mint Springs Farm in Nolensville, Tennessee, on October 12, 2018. On April 15, 2019 they announced they are expecting their first child. They currently reside in Nashville, Tennessee. "Don't Go City on Me"
"I Love That I Hate You"
"Lost in the Middle of Nowhere"
"Setting the Night on Fire"
"Baby Come Back to Me"
^ "Thunder in the Rain" did not enter the Billboard Hot 100, but peaked at number 22 on the Bubbling Under Hot 100 chart. ^ "Lost In the Middle of Nowhere " did not enter the Billboard Hot 100, but peaked at number 24 on the Bubbling Under Hot 100 chart. ^ "Homesick" did not enter the Billboard Hot 100, but peaked at number six on the Bubbling Under Hot 100 chart. ^ a b "Kane Brown biography". AllMusic. Retrieved November 10, 2018. ^ Watts, Cindy (December 1, 2016). "Raising Kane Brown: Biracial singer forges own path in country music". The Tennessean. ^ Bjorke, Matt (October 19, 2015). "The Rise of Kane Brown, Independent Country Sensation". Roughstock. ^ a b Asker, Jim (October 17, 2017). "Kane Brown Becomes First Artist To Simultaneously Lead Five Country Charts". Billboard. ^ Freeman, Jon (December 2, 2016). "Kane Brown on Personal New Album, Why He Won't Sing First Hit: Ram Report". Rolling Stone. ^ Hoffman, Lauren (March 6, 2017). "Exclusive Interview: Kane Brown". Froggy101. ^ Lorge, Melinda (October 4, 2017). "Kane Brown brings his mom to tears in heartwarming video". Rare Country. ^ a b Caramanica, Jon (December 4, 2016). "Kane Brown Reaches to Reconcile Two Sides in His Sound". The New York Times. ^ a b Yahr, Emily (December 8, 2016). "Kane Brown could be the future of country music. So why is the industry skeptical?". The Washington Post. ^ Falcone, Dana Rose (November 21, 2018). "Kane Brown Opens Up About Being Called the N-Word as a Kid: 'I Thought I Was Full White'". People. ^ Moss, Marissa R. (November 1, 2018). "How Kane Brown Became the Future of Country". Billboard. ^ a b Swirsky, Jen (November 7, 2014). "Meet Kane Brown". Country Music Chat. 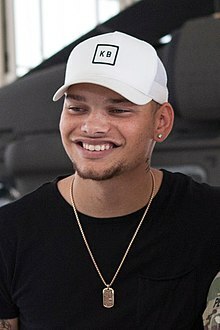 ^ "Kane Brown: Biography". BandPage. Archived from the original on March 21, 2016. ^ a b c Courter, Barry (October 19, 2015). "Meet Chattanooga's Kane Brown". Times Free Press. ^ Scott, Hope (July 2, 2015). "Get Closer to Kane Brown". The Shotgun Seat. ^ a b Hight, Jewly (March 25, 2016). "YouTube Upstart Kane Brown Is Breaking Country's Rules: 'The World's Not Used to It'". Billboard. ^ a b "Brown is the New Black". Hits Daily Double. October 8, 2015. ^ a b Caulfield, Keith (October 23, 2015). "Billboard 200 Chart Moves: Indie Country Singer Kane Brown Breaks Into Top 40". Billboard. ^ "Kane Brown's debut EP". Kickstarter. ^ Bjorke, Matt (October 29, 2014). "Country Music's Top 30 Digital Singles: October 29, 2014". Roughstock. ^ Cantor, Brian. "Emerging country star Kane Brown makes a sudden – and significant – splash on the iTunes single sales chart". Headline Planet. ^ Bjorke, Matt (October 27, 2015). "Top 30 Digital Singles: October 27, 2015". Roughstock. ^ Trust, Gary (October 28, 2015). "Drake Returns to No. 1 on Billboard Artist 100; Demi Lovato & Pentatonix Surge". Billboard. ^ Bjorke, Matt (November 9, 2015). "Top 30 Digital Singles: November 9, 2015". Roughstock. ^ Bjorke, Matt (December 7, 2015). "Top 30 Digital Country Singles: December 7, 2015". Roughstock. ^ Dukes, Billy (February 22, 2016). "Florida Georgia Line Eager to Mentor Kane Brown on Dig Your Roots Tour". Taste of Country. ^ "Chandler Stephens & Kane Brown – Can't Stop Love". New Country Songs. ^ Dukes, Billy (January 28, 2016). "Kane Brown Signs With Sony Nashville". Taste of Country. ^ Vinson, Christina (March 10, 2016). "Kane Brown Announces Debut EP, 'Chapter 1'". The Boot. ^ Caulfield, Keith (March 27, 2016). "Gwen Stefani Scores Her First No. 1 Album on Billboard 200 Chart". Billboard. ^ "Kane Brown – Ain't No Stopping Us Now". New Country Songs. ^ "Ain't No Stopping Us Now – Single". iTunes Store. ^ Reuter, Annie (July 18, 2016). "Kane Brown Books Headlining Ain't No Stopping Us Now Tour". Taste of Country. ^ Graff, Gary (December 2, 2016). "Kane Brown on His Self-Titled Debut: 'It's Pretty Much My Childhood on That Record'". Billboard. ^ a b c d "American single certifications – Kane Brown – What Ifs". Recording Industry Association of America. If necessary, click Advanced, then click Format, then select Single, then click SEARCH. ^ Whitaker, Sterling (August 22, 2017). "Kane Brown Duets With Chris Young on Deluxe Edition of Debut Album". Taste of Country. Retrieved September 12, 2017. ^ "Kane Brown Drops Brand-New Song, 'Lose It' [LISTEN]". The Boot. June 7, 2018. ^ Drysdale, Jennifer (April 25, 2017). "Country Star Kane Brown Is Engaged to Katelyn Jae". ETOnline. ^ Courter, Barry (August 31, 2017). "Kane Brown coming home to headline first CountryFest". Times Free Press. ^ Heller, Corinne (October 13, 2018). "Kane Brown and Katelyn Jae Are Married". E!. ^ Krol, Jacklyn (April 15, 2019). "Kane Brown and Wife Katelyn Jae Expecting Their First Child". Taste of Country. ^ a b "Kane Brown Chart History (Billboard 200)". Billboard. Retrieved October 10, 2017. ^ a b "Kane Brown Chart History (Top Country Albums)". Billboard. Retrieved October 10, 2017. Kane Brown: "ARIA CHART WATCH #398". auspOp. December 10, 2016. Retrieved December 10, 2016. Experiment: "Discography Kane Brown". australian-charts.com. Retrieved March 12, 2019. ^ a b "Kane Brown Chart History (Canadian Albums)". Billboard. Retrieved October 10, 2017. ^ "American album certifications – Kane Brown – Kane Brown". Recording Industry Association of America. If necessary, click Advanced, then click Format, then select Album, then click SEARCH. ^ a b Bjorke, Matt (April 8, 2019). "Top 10 Country Albums: April 8, 2019". Roughstock. Retrieved April 12, 2019. ^ Bjorke, Matt (March 28, 2016). "Country Album Chart: March 29, 2016". Roughstock. ^ Bjorke, Matt (September 6, 2017). "Top 10 Country Albums Sales Chart: September 5, 2017". Roughstock. ^ a b "Kane Brown Chart History (Hot 100)". Billboard. Retrieved October 10, 2017. ^ a b "Kane Brown Chart History (Hot Country Songs)". Billboard. Retrieved October 10, 2017. ^ "Kane Brown Chart History (Country Airplay)". Billboard. Retrieved October 10, 2017. ^ "Kane Brown Chart History (Canadian Hot 100)". Billboard. Retrieved October 10, 2017. ^ "Kane Brown Chart History (Canada Country)". Billboard. Retrieved October 10, 2017. ^ "American single certifications – Kane Brown – Used to Love You Sober". Recording Industry Association of America. If necessary, click Advanced, then click Format, then select Single, then click SEARCH. ^ a b Bjorke, Matt (July 5, 2016). "Top 30 Digital Country Songs Chart: July 5, 2016". Roughstock. ^ Bjorke, Matt (November 24, 2015). "Top 30 Digital Country Singles Chart: November 23, 2015". Roughstock. ^ Bjorke, Matt (December 13, 2015). "Top 30 Digital Singles Chart: December 14, 2015". Roughstock. ^ a b c "Kane Brown Chart History: Bubbling Under Hot 100". Billboard. Retrieved February 20, 2019. ^ Bjorke, Matt (January 3, 2017). "Top 30 Digital Singles Sales Report: January 3, 2017". Roughstock. ^ "Canadian single certifications – Kane Brown – What Ifs". Music Canada. ^ a b Bjorke, Matt (January 15, 2019). "Top 30 Digital Singles: January 15, 2019". RoughStock. Retrieved January 16, 2019. ^ "American single certifications – Kane Brown – Heaven". Recording Industry Association of America. If necessary, click Advanced, then click Format, then select Single, then click SEARCH. ^ "Canadian single certifications – Kane Brown – Heaven". Music Canada. ^ Cite error: The named reference single rs apr2019 was invoked but never defined (see the help page). ^ a b http://www.roughstock.com, Roughstock- (April 15, 2019). "Top 30 Digital Country Singles Chart: April 15, 2019". RoughStock. ^ "Can't Stop Love – Single". February 12, 2016. ^ "Chatt Chatt (feat. Kane Brown) – Single". August 10, 2017. ^ "Chattanoogan Hooligan by Haden Sightz on Apple Music". iTunes Store. Retrieved October 20, 2018. ^ "Never Be the Same (feat. Kane Brown) – Single". April 27, 2018. ^ "American single certifications – Kane Brown – There Goes My Everything". Recording Industry Association of America. If necessary, click Advanced, then click Format, then select Single, then click SEARCH. ^ a b c Bjorke, Matt (March 27, 2016). "Top 30 Digital Country Singles Chart: March 29, 2016". Roughstock. ^ "American single certifications – Kane Brown – Found You". Recording Industry Association of America. If necessary, click Advanced, then click Format, then select Single, then click SEARCH. ^ Bjorke, Matt (September 26, 2017). "Top 30 Digital Country Singles Sales Chart: September 25, 2017". Roughstock. ^ Bjorke, Matt (October 23, 2017). "Top 30 Country Digital Singles Sales Chart: October 23, 2017". Roughstock. Retrieved October 26, 2017. ^ Bjorke, Matt (October 17, 2017). "Top 30 Digital Country Chart: October 17, 2017". Roughstock. ^ "The Top 30 Digital Country Tracks: August 14, 2018". RoughStock. Retrieved August 21, 2018. ^ "CMT : Videos : Kane Brown : Used To Love You Sober". Country Music Television. Retrieved December 15, 2015. ^ "Kane Brown – Used To Love You Sober" – via Vimeo. ^ Staff, Variety (April 3, 2017). "ACM Awards Winners 2017: Updated List". Variety. Retrieved May 10, 2017. ^ "Lauren Alaina, Brett Young and Midland named early winners at the ACM Awards". The Tennessean. Retrieved March 26, 2018. ^ "Billboard Music Awards 2018 Nominations: See the Full List". Billboard. April 17, 2018. ^ Hudak, Joseph (June 7, 2018). "2018 CMT Music Awards: The Complete Winners List". Rolling Stone. Retrieved June 7, 2018. ^ Dukes, Billy (October 10, 2018). "Let's Recap Kane Brown's Amazing Night at the American Music Awards". Taste of Country.